The Kindergarten students have been learning about the Indonesian rain forest and the animals that live there. The students know that the Sumatra rain forests are disappearing faster than in any other part of Indonesia. With the loss of the rain forest some animals are also endangered as they are losing their habitat. The Sumatran tiger, the Sumatran rhino, the tapir, the orangutan and the Sumatran elephant are all endangered and at risk of becoming extinct. The kindergarten students made charts indicating which animals were endangered in Indonesia. Students in Grade 1 / 2 have been learning the numbers from 0-25 in Bahasa. 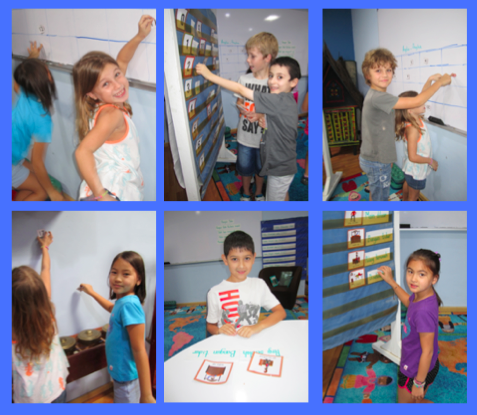 The children participated in a variety of learning activities in order to learn the numbers: number hunt, language program, and match pictures and words on the board. I am truly impressed with the fact that almost all the students know how to say the numbers in Bahasa. Grade 3 / 4 students have been learning how to tell time and to track daily routines in Bahasa. It was fun when students shared their daily activities because each student had a different time schedule and different activities! Max said he has never had breakfast, Caitlyn shared that she only watches TV on weekends! Eamon shared that he can wake up at 7:00am because his house is very near to the school. The one thing that all students had in common is that they all do homework. 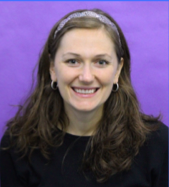 I’m excited to share a variety of technology resources with you to enhance your child’s Spanish language acquisition process. Our students learn not only the traditional skill areas of reading, writing, listening and speaking, but also cultural acquisition in the program and technology has a way of bringing more than one modality alive at the same time. At www.duolingo.com you can create a free account and begin learning Spanish in a fun interactive way immediately. Duolingo was Apple’s 2013 App of the year, and you’ll see why with an intuitive interface, competitive and rewarding video game components, and social media interaction for motivation or “bragging rights” with family and friends. It’s easy to spend just ten to fifteen minutes a day to learn new words and practice old ones. One study found that learning with Duolingo for 26-49 hours would be tantamount to the first semester of a university course. The aim of Duolingo is two-fold: to help people learn new languages and to translate the Web. Yes, that’s right, it’s an ambitious, egalitarian goal and all at absolutely no cost. There are listening, reading, writing and speaking activities that will engage most learners. The only aspect that Duolingo lacks is a cultural context, and at www.spanish.yabala.com there is an abundance of videos (over 1,000 equaling 54 hours) which delve into the human and cultural aspect of Spanish. There are videos on every possible topic including: travel, food, music, science, fashion and many more. The amazing thing about this site is the text to audio interface. After watching the initial video with Spanish and English subtitles (which can be hidden), students play a gap-fill game in which they need to find the missing word and type it in. The game is played in two rounds and can be repeated as the words change with each playing. Each video is rated for its difficulty and the speaker’s accent is categorized so that students may practice listening to the many different ways Spanish is spoken. There is a vocabulary study function as well. We sampled the song Fotografía by Juanes in the middle school class, and students were completely immersed in the 3 minute video for an entire lesson. Lastly, Te Toca, or “Your Turn”, (http://dilealsol.es/1OCA/oca1024.swf) is an interactive website from Spain with 20 categories from colors and numbers to grammar and spelling that plays like a board game. You’ll need some understanding of Spanish to navigate the menu, but you can also explore the settings options for number of players (jugadores) and how to answer (eligiendo o escribiendo). Once in the game, students must correctly identify images by either clicking on the correct answer, or typing it in the box. There are some fun surprises inside the game board, so watch out! These are just a few of the ways you and your child can study Spanish independently in fun and meaningful ways with a simple internet connection. While Duolingo and Te Toca are free, to get beyond the sample videos in Yabala takes a subscription. Luckily, we have just purchased a membership and in class we’ll begin to use grade level appropriate selections. ¡Buena suerte! One of the fundamental concepts in math: composing and decomposing, “putting together and taking apart,” can be explored in young children’s play contexts. As parents, we often use counting and shape identification to teach a young child math concepts. This is only the beginning of helping the child fully understand these two important concepts. We can further develop these understandings in play. The idea of composing and decomposing can help children to recognize shifts from a whole to its parts and begin to think about numbers and shapes in similar ways. 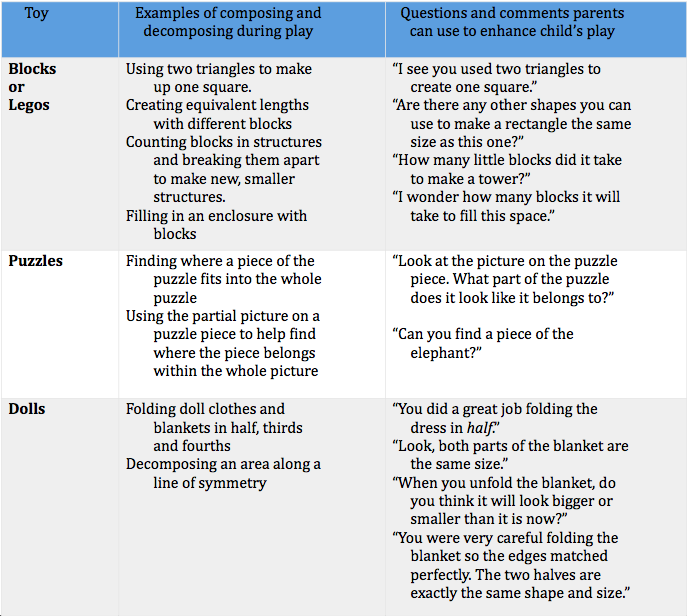 Using blocks, puzzles and dolls, the table below lists questions and comments parents can use to enhance the composing and decomposing concepts during play. By highlighting these math concepts as they occur, we can help children begin to make better sense of the abstractness of mathematics. Sir Ken Robinson has some interesting views on the importance of an education that is well rounded and embraces creativity. This is a worthwhile TED talk if you have a few minutes. Studying music primes the brain to comprehend speech in a noisy background. Research shows that music is to the brain as physical exercise is to the human body. Music tones the brain for auditory fitness and allows it to decipher between tone and pitch. 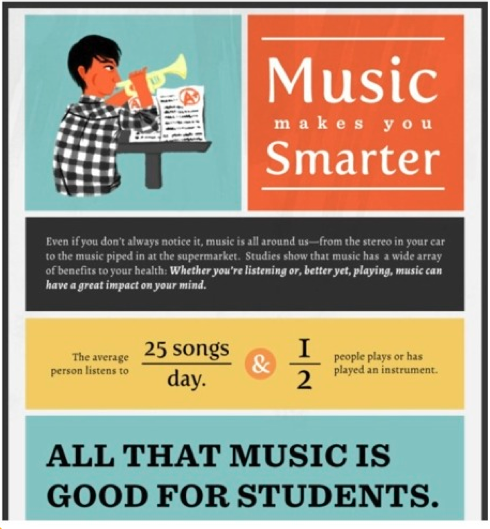 Regardless of socioeconomic status or school district, students who participate in high-quality music programs score 22 percent better on English and 20 percent better on Math standardized exams. Much like expert technical skills, mastery in arts and humanities is closely correlated to high earnings. A study from Columbia University revealed that students who study arts are more cooperative with their teachers and peers, have higher levels self- confidence, and are more equipped to express themselves and their ideas. With the elementary school getting ready to start another round of 6+1 writing assessments, I thought families who were unfamiliar with the program might be interested in what exactly these “six” and the “plus one” were. Six Traits Writing is an approach for looking at writing one part at a time. Since writing is such a complicated activity, this approach helps many students break down the task and better understand it. By focusing on and scoring only one trait at a time, a writer/reader can break down a complex activity like writing and make it more manageable. With practice, writers can then learn to be more critical of their own work and can make improvements in the quality of their writing. Perhaps, more than anything else, the six traits give teachers and students a common vocabulary for talking and thinking about writing. 1. Ideas and Content are in a sense the heart of the writing. Everything that is said comes back to ideas and content. The two keys are clarity and details. Making a topic clear and manageable is so important. Details can make or break any piece of writing. Ideas and content focus on clear writing that presents details in an interesting, fresh manner. 2. Organization is just the way it sounds, organizing a paper so it is easy for the reader to follow. The trait of organization is the hardest for students to master. They have trouble seeing the big picture in their writing. Often times making students aware of methods or shortcuts to good organization is key. 3. Voice is the author’s fingerprint on the page. An author’s voice is the personal touch through which the reader feels more in touch with the writer’s emotions, opinions, and personality. Voice is a favorite trait of students. They love to read books with effective voice, which in turn carries over to their writing. 4. Sentence fluency is a trait based solely on the ear. Students need to tune their ears to the rhythm and cadence that can be accomplished with sentence fluency. Using the natural flow of poetry can add clarity to this trait. Focusing on variety in sentences can help attain fluency. 5. Word choice is a trait that shows the power of language. Sometimes students seem so caught up in their ideas, organization, and grammar that word choice may take a backseat. Showing students the use of good word choice opens their eyes to a whole new world of writing. 6. Conventions are the editing and revising component of writing. Is a student’s paper is error free (or close!) and ready to be published? Many people would say that this trait is the most time consuming of the six because of its depth and importance. +1 is the presentation, a combination of both visual and textual elements. Some of the components teachers will be looking for are balance of white space with visuals and text, graphics, neatness, handwriting, font selection, borders, etc. The grade 3’s and 4’s will soon start five paragraph essays that compare and contrast two versions of the same fairy tale (Cinderella). This topic should give them every opportunity to really excel at each of the six writing traits. Between the ages of 3 and 5, your child's personality is really going to develop. As preschoolers gain more confidence, self- expression and control, they begin to rely less on adults and more on themselves. They're learning how to calm themselves when they get excited, frightened, or upset, and they're becoming more attentive and less emotionally reactive. They are also learning how to treat others. By age 5, kids typically start showing more concern for mom and dad, at last starting to understand that you have your own needs and feelings. They also begin to show affection more easily, develop a fantasy life, and may see-saw between being demanding and being cooperative. 1. Remember that your child is unique. Parenting that is sensitive and responsive to the individual strengths and needs of the child fosters healthy personality development. 2. Encourage play. Play is a huge influence on a child's development. Experts say that giving kids time to play is key to helping your child's personality blossom. Play helps kids develop physically, mentally, and emotionally. 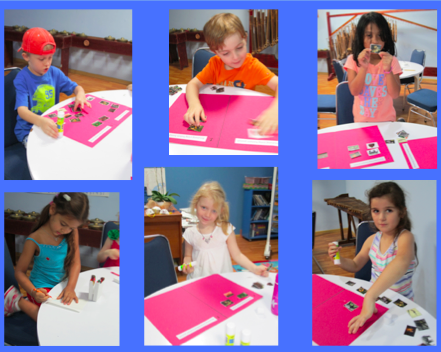 It teaches them to work in groups, settle conflicts, develop their imagination, and try on different roles. When kids play, they practice decision-making, learn to stand up for themselves, create, explore, and lead. 5. Realize it's nature and nurture. Don't chalk up your child's personality to just his or her nature or just the nurturing you provide. Is your child’s New Year’s Resolution to become a better reader? If so, then check out these comprehension strategies! Was it important to you? Why or why not? Did you like it? Why or why not? Holidays are a time of great anticipation and excitement. In many of our minds, we paint pictures of idyllic Norman Rockwell family moments. Smiling, tranquil children who perch upon our laps to enjoy reading stories or playing board games. Wonderful walks together, exploring historical sites, zoos or beaches. The whole family having a lay in and enjoying a few extra moments of sleep and togetherness. And then reality comes swaggering through the door, balancing a giant, overstuffed suitcase on his head with a few over-stimulated children in tow. Or is this just what happens at my house? To solve this riddle, I turned to my good friend the internet to see what other people were talking about. Sadly, it turns out there is no one, right answer. But, the good news is that lots of people are talking and thinking about this same idea. Listed below, are a few of the ideas that seemed most relevant to our Kindergarten families. Holiday Safety: Tip #1 and a great reminder for the Kindergarten kiddos. Check the temperature of hot water in your hotel room upon arrival. If it’s a lot hotter than at home, share this information with the kids and maybe even make a ‘cold water only’ rule. Jet Lag and Routines: Tip #2 and one I recall posting with Rumbai friends about on our last trip to Canada! Resume your normal hours and routines as soon as possible. Get up early(-ish) and get outside in the sunlight to help your body readjust to the new hours. Good luck to those of you making a long journey over Christmas. Holiday Activities and Outings: With older kids, it can be fun to show them ways to help them preserve memories of your trip. They could fill a holiday scrapbook with tickets, postcards, badges and maps, as well as their own drawings and thoughts – and, if you're abroad, maybe even a list of some of the words they've learnt in the local language. Love this idea. Very portable and will keep them busy looking for things to add. The fifth and sixth grade students have been tirelessly working with their stream tables to collect evidence to answer the question, what created the Grand Canyon? “cutting” of the plateau. 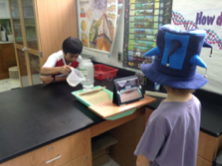 All data is collected through video, which the students analyze later to determine their results. What have we proved so far? The first variable we looked at was water flow. The students were able to determine that there was a correlation between rate of water flow and “cutting” of the plateau. 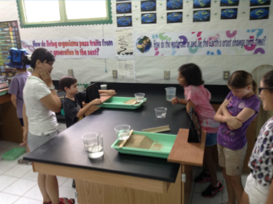 Students were also able to determine that lighter objects are deposited farther downstream than heavier objects. This exciting discovery was shown by mixing clay powder and sand in the stream table and observing which materials ended up farther from the water source. Having run three different steam table investigations, the students are now ready to conduct their own experiments based on other variables that helped create the Grand Canyon. 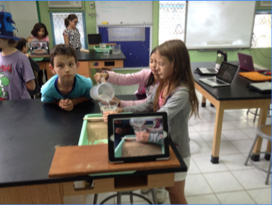 Some students have elected to investigate how steepness changes the rate of erosion, while others are building dams in the water flow to simulate volcanic activity that took place early in the Grand Canyons development. 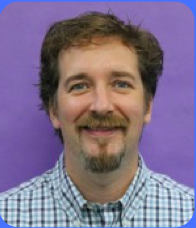 To finish the project the students will compile all of their data and form a committee of experts. As a committee, they will be asked to convince a panel of judges that their theory on how the Grand Canyon formed is correct. This will be a great way for students to practice being Expressive Communicators and Thinkers and Problem Solvers! Look at all the fun we are having!